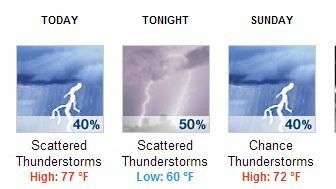 Saturday Memo: Thunder and more showers…ride to end cancer…Ken Griffey Jr.
That was loud. Unstable air mass triggered a lightning and thunder show over many parts of Puget Sound last night. And there’s a chance today for more flash showers, especially near the Cascade foothills. A whole lot of bikers with a cause. The weekend-long ride Obliteride continues today through Sunday. Hundreds of bicyclists will be riding 25, 50, 100 or 180 miles through Seattle, the Eastside and Tacoma — all to raise money and awareness for Fred Hutchinson Cancer Research Center. Not riding? If you or your family or your friends have ever been touched by cancer, considering heading over to Seattle’s Magnuson Park for the festivities. Here’s the schedule, including live music. It’s called the River of No Return for a reason. That’s the rugged, mountainous area in central Idaho where suspected killer James Lee DiMaggio is thought to be hiding out along with 16-year-old Hannah Anderson. DiMaggio is suspected of killing Hannah’s mother Christina Anderson, 44, and her 8-year-old brother, whose bodies were found Sunday night. For the latest in the developing story, go here. Junior will be inducted into the Mariners Hall of Fame today. Twenty-two years in the bigs and so many memories. Bob Condotta breaks down the top 10 moments. What you really want to look at is our photo gallery. The ceremony will take place before the Mariners’ game, starting at 5 p.m.